Multi step complexion care routines are being embraced by more and more skin care aficionados. One step in these involved routines is an essence or concentrate. Used before a serum, concentrates deliver potent skin transforming ingredients where they are needed most to help refine texture and even the skin tone. Refine texture and imperfections to restore the visible qualities of perfect skin. This potent, non-acidic skin-renewing formula restores the visible qualities of healthy skin to unveil a perfected complexion. Formulated with a complex of five powerful enzymes, this ultra-lightweight concentrate gently removes dead surface cells and promotes skin renewal for improved texture and clarity. Patented NIA-114™ technology helps strengthen the skin barrier while delivery of moisture throughout the night leaves skin soft, supple and hydrated. With continued nightly use, the most micro of imperfections are refined, for skin that is visibly transformed even under a close-up lens. Does this concentrate live up? Packaged in a small plastic bottle with a dropper pipette delivery is a low viscosity, white liquid that spreads readily across the skin, drops in immediately and leaves behind no sticky or oily after feel. As soon as it absorbs, my skin feels smoother and more velvety and ready to accept the rest of my skin care routine. In the morning, my complexion feels more hydrated and a little firmer. What long term benefits? My skin seems even just a bit brighter, the overall tone more refined and the appearance of my skin is improved. I think that it's safe to say that this stuff works. Aqua (Water, Eau), Squalane, Butylene Glycol, Glycerin, Bromelain, Ceteareth-20, Glyceryl Stearate, Papain, Tocopheryl Acetate, Myristyl Nicotinate, Hydrolyzed Opuntia Ficus-Indica Flower Extract, Mucor Miehei Extract, Enantia Chlorantha Bark Extract, Laminaria Digitata Extract, Yeast Extract, Ethylhexylglycerin, r-Bacillus Licheniformis Keratinase, Soy Amino Acids, Lecithin, Caprylyl Glycol, Glyceryl Caprylate, Oleanolic Acid, Superoxide Dismutase, Xanthan Gum, Acrylates/C10-30 Alkyl Acrylate Crosspolymer, Sorbitol, Carbomer, Algin, Calcium Chloride, Sodium Chloride, Solum Diatomeae (Diatomaceous Earth) (Terre de diatomées), Disodium EDTA, Tromethamine, Sodium Hydroxide, Citric Acid, Phenoxyethanol, Potassium Sorbate, Sodium Benzoate, Methylisothiazolinone. 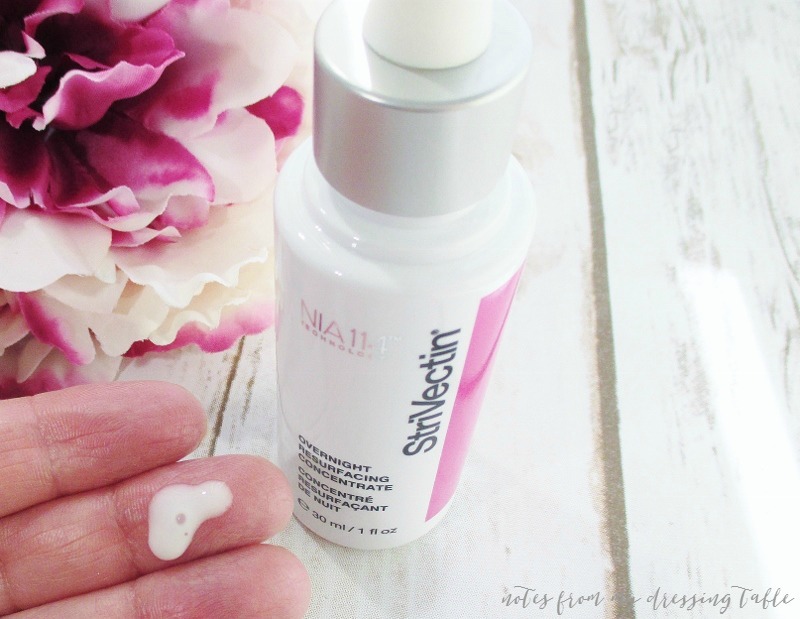 StriVectin Overnight Resurfacing Concentrate Is free of chemical sunscreens and has a light, somewhat "chemical-y" scent that dissipates upon application. Don't forget to use a high SPF sunscreen, daily to protect your fresher, brighter complexion from UV exposure. If you would like to try this first step wonder, you can buy it from Nordstrom, Macy's, Lord & Taylor and from StriVectin. Don't forget to use EBATES to earn cash back on your purchase. If you aren't yet a member, click my link to sign up. It's fast, easy and free! 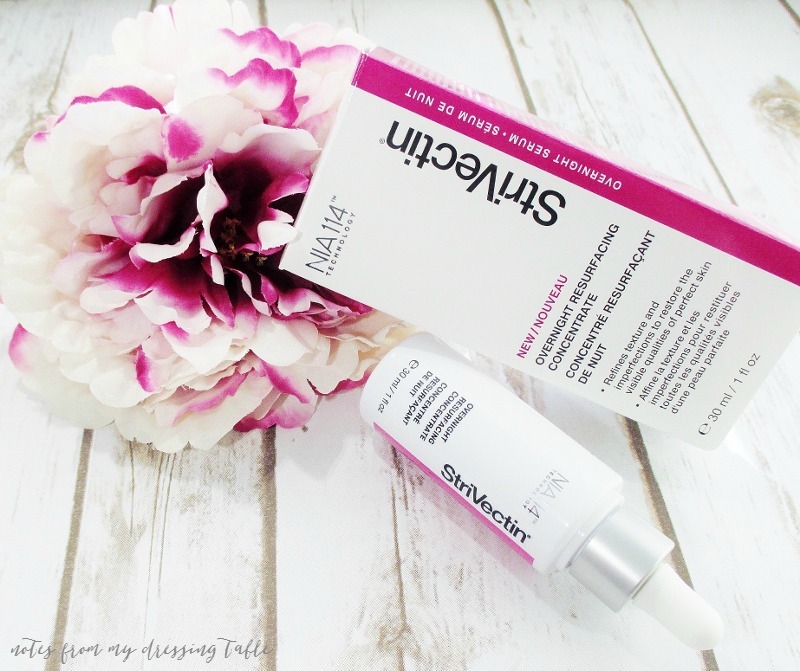 Have you tried the StriVectin Overnight Resurfacing Concentrate or any StriVectin skin care? What kind of results have you seen? Please share in a comment. Fashion Flash -- Fall Edition is Live!